The Ohio Country was the name given to the territory roughly west of the Appalachian Mountains and north of the Ohio River prior to the American Revolution. Its boundaries were not clearly defined. It consisted of approximately modern-day Ohio, eastern Indiana, western Pennsylvania, and northwestern West Virginia. Throughout the 1600s and 1700s both England and France claimed ownership of the Ohio Country. By the mid-1700s, both nations had sent merchants into the area to trade with local American Indians. With both sides wanting to dominate the region, the period was a violent one. With the signing of the Treaty of Paris (1763), marking the conclusion of the French and Indian War, England gained control of the Ohio Country from the French. Although the English no longer had to contend with the French, they still had to reckon with the American Indian peoples of the region -- including the Shawnee, the Seneca-Cayuga, the Wyandot, and the Lenape (Delaware), among others -- who were upset by the constant influx of Anglo-American settlers onto American Indian lands. 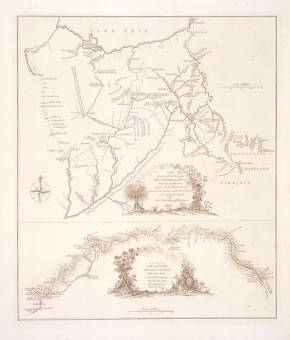 To prevent bloodshed and to reduce military expenses, England issued the Proclamation of 1763, which prohibited their colonists from living west of the Appalachian Mountains. A major reason for the French and Indian War had been the colonists' desire for access to the fertile Ohio Country lands. This English policy partly led to the American Revolution by convincing the people living in what is today the United States that England did not understand or have the colonists' best interests at heart.